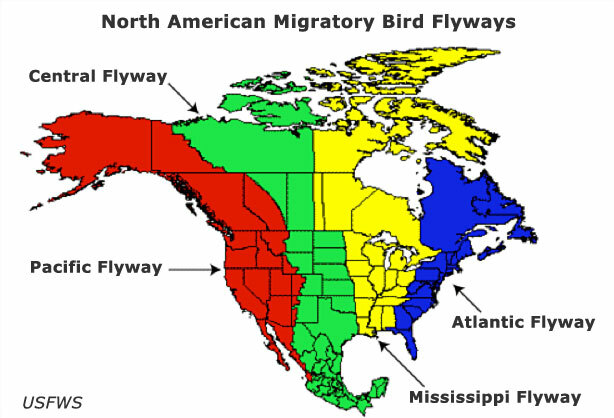 These are the four flyways that exist in North America. As you can clearly see in the map, in Sinaloa ( just across the tip from Baja), the Pacific and the Central flyways meet, providing the state with the duck species from both flyways, making the hunt more enjoyable and rich in ducks. 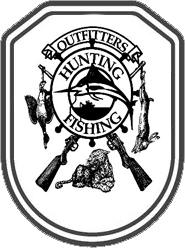 we also get some ducks from the Mississippi flyway and some of the species you can find are listed below. Pintails are long, slender ducks with long, narrow wings, earning them the nickname "the greyhound of the air." The length of the neck in relation to the torso is longer on the pintail than on any other duck. Males have a dark brown head with a white stripe on each side of the neck coming up from the white breast and belly. The back is blackish gray and the rump has a white patch on each side. The central tail feathers are black and elongated, making up one-fourth of the drakes length. The speculum is iridescent greenish black, which may help with identification on the wing. Females have a dark brown upper body, with lighter brown or gray head and lower body. The female's speculum is a dull brown or bronze. Average length: M 25", F 21"
Average weight: M 2.2 lbs., F 1.9 lbs. Pintails are one of the first ducks to migrate south in the fall and north in the spring. Over half of the pintails in North America migrate through California. The majority of these remain in California for the winter but some continue on to the west coast of Mexico or to northern South America. The Central flyway is used by pintails that breed in Canada and winter in the Texas panhandle, Gulf Coast of Texas, and western Louisiana. Pintails use the Mississippi flyway between breeding grounds in Manitoba and eastern Canada and wintering grounds in Arkansas, Tennessee, and Mississippi. Along coastal wintering grounds, pintails concentrate on shallow fresh or brackish estuaries adjacent to agricultural areas. 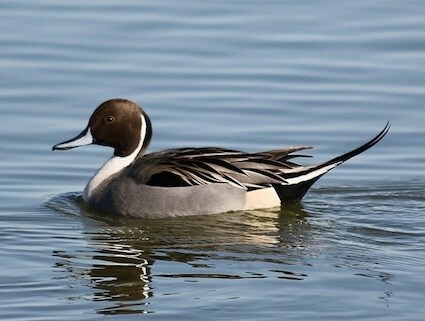 Pintails breed across Canada, the northern United States and into eastern Siberia. Prairie and tundra habitats are extremely important to pintails, providing shallow marshes and lakes with low and dense vegetation around the edges. Pintails prefer to nest in dry locations, which can be up to a mile from the nearest water. Males have a cinnamon-red head, neck, breast, and belly. They have an iridescent green speculum which is separated from a bluish shoulder patch by a white stripe. The back, rump, uppertail coverts, and tail are a dull brown and the undertail coverts are black. They have a distinctive red eye, and yellow feet and legs. 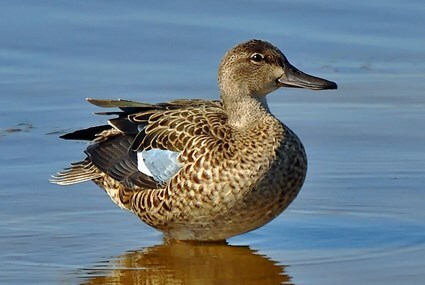 Females are similar to the female blue-winged teal except for the blue shoulder patch is duller, they have an overall rustier color, and they are more heavily streaked. Average length: M 16", F 15"
Nearly all cinnamon teal winter in Mexico and Central America. During migration they stopover in the Great Salt Lake marshes and Central Valley of California. Cinnamon teal sighted in the midwest and eastern United States, often are associated with a flock of blue-winged teal, most likely attaching themselves to the flock at their mutual breeding grounds. Most cinnamon teal breed in the western United States. The Great Salt Lake, Malheur Basin, San Luis Valley, and Cariboo-Chilcotin parklands are all used by breeding cinnamon teal. They prefer small, shallow alkaline wetlands surrounded by low herbaceous cover. Nests are often located in grassy areas and island nesting is common. We also have Green-wing teal as well as Blue-wing teal. Gadwalls are medium-sized ducks characterized by a general lack of bright coloration. Males are gray-brown, with a white belly, black rump, and black bill. Females are similar to males, but with a mottled brown appearance and yellowish bill with dark spots. Both sexes are distinguishable from other ducks by the presence of a white speculum, most visible in flight. Average length: M 21", F 19"
Average weight: M 2.0 lbs., F 1.8 lbs. Gadwalls are distributed throughout the southern two-thirds of the US in winter, with the greatest concentrations found in the Central and Mississippi flyways. They are found throughout much of the intermountain west, and most of Mexico, in reservoirs, farm ponds, and coastal fresh and brackish marshes. Aquatic vegetation makes up the majority of this duck's diet. 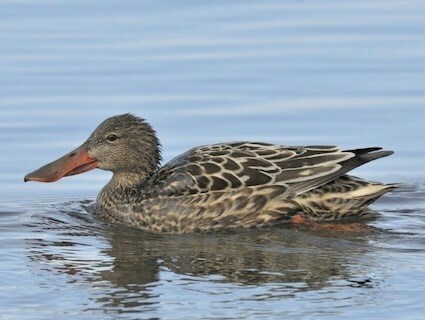 As a result, gadwalls can be found feeding far from the shoreline, in deeper water than most other dabbling ducks. They are often found in association with American wigeon and American coots. Gadwalls breed near seasonal and semi-permanent wetlands, mainly in the shortgrass, tallgrass, and mixed prairie regions of the United States and Canada. Substantial numbers also breed in wetland habitats of the Great Basin. 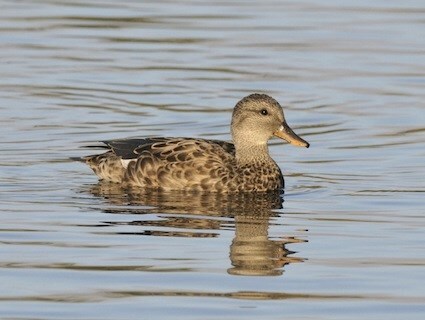 Gadwalls tend to begin breeding later than most ducks. Male wigeons have a white patch from the forehead to the middle of the crown and an iridescent green band from the eye to the back of the head. They have a pinkish-brown breast and sides that are separated from the black undertail coverts by white flank feathers. In flight the white shoulder patch is diagnostic. 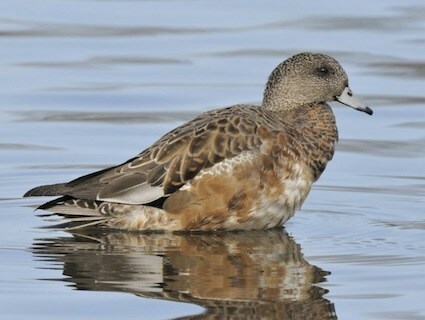 The female wigeon has a gray head with a brownish black crown and a brownish chest and sides. Both males and females have a bluish black-tipped bill. Average weight: M 1.8 lbs., F 1.6 lbs. Wigeons nest farther north than any other dabbling duck except the pintail. They breed throughout northern Saskatchewan, Alberta, and Manitoba, Alaska, and the Northwest Territories. 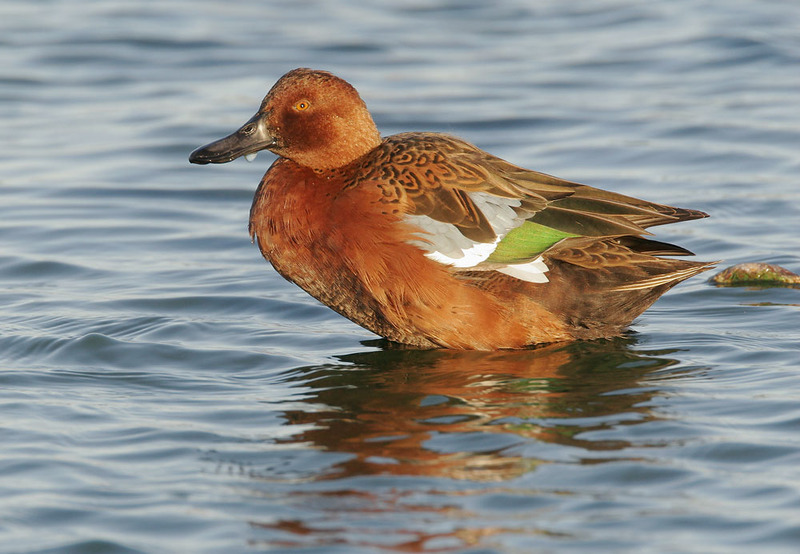 Wigeons prefer shallow lakes and marshy sloughs with submerged vegetation and surrounded by dry sedge-lined meadows. 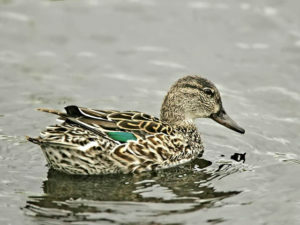 Males have an iridescent green head and neck, white chest and breast, and chestnut belly and sides. They have a white stripe extending from the breast along the margin of the gray-brown back, and white flank spots. The wings have a gray-blue shoulder patch separated from a brilliant green speculum by a tapered white stripe. Females have a light brownish head with a blackish crown, and a brownish speckled body. The upper wing coverts are grayish-blue, the greater secondary coverts are tipped with white, and the secondaries are brown with a slight greenish sheen. Perhaps the most visible diagnostic characteristic of the northern shoveler is its large, spoonshaped bill, which widens towards the tip and creates a shape unique among waterfowl. Average length: M 19", F 19"
Average weight: M 1.5 lbs., F 1.4 lbs. Northern shovelers fly from the prairie pothole region through the Pacific or Central Flyway, with major stopover areas in the Great Salt Lake, Malheur Basin, and Carson Sink. They winter in California, coastal Louisiana, Texas, and Mexico, and the north and central highlands of Mexico. Wintering habitat includes fresh and brackish coastal marshes, and still-water ponds. Saltwater wetlands are generally avoided. Northern shovelers breed in the parklands, short- and mixed- grass prairies of Canada, and the grasslands of northcentral US. The prefer shallow marshes that are mud-bottomed and rich in invertebrate life. Nest sites are generally located in grassy areas without any woody cover and away from open water.